Burnt with metal rods and cigarette butts? Maybe so, says the Border Agency, but you paid someone to do this to you. A surgeon with expertise in torture scars argues that 'self-torture by proxy' is a dangerous fiction. At his asylum interview, he gave copies of these photographs to the UK Border Agency case officer. He explained that he had been tortured by branding with hot metal rods, late last year while being interrogated by the Sri Lankan security forces. He also handed over a recent letter from his new NHS GP which described the doctor's examination findings confirming the presence and nature of the scars and added that the patient was being started on treatment for post-traumatic stress disorder. The asylum claim was rejected. In the “Reasons for Refusal” sent to the applicant and his lawyer, each page was headed by a strapline “the factual accuracy of statements recorded in this letter has been assessed for immigration purposes only”. The doctor's letter was not even mentioned. Nor does the interview record (written by that caseworker) show that the asylum seeker was informed that he needed to provide a “medical report”. '[A Colombo based human rights worker] added that is was well known that many persons who were held in IDP camps at the end of the conflict scarred themselves so that on release they could make allegations that the Sri Lankan government had tortured the.” (Sri Lanka COI report, dated 4 July 2011, para 8.35'"
What lies behind the bizarre contention that anyone could or would pay another to damage them to the extent shown in the photographs? This is not a one-off case. That precise argument (self-torture by proxy for malicious ends) has been produced by Immigration Judges or Border Agency caseworkers in at least 10 Sri Lankan cases with equally blatant evidence of torture in which I have examined the subject and at least twice as many seen by colleagues. 1. The basis of these asylum claims was the blatant evidence of torture. How likely is it that someone could or world pay others to damage them so severely? From extensive experience of inflicting pain as a surgeon and suffering it as a patient I am certain that the answer is that no one could hold still for such harms without a general anaesthetic (which is and was almost certainly unavailable to detainees in displaced persons camps in Sri Lanka.) A colleague has carefully searched the world medical and legal literature on factitious torture. So have I. We have found a tiny number of cases, none of them connected with asylum or Sri Lanka. Absent hard evidence in the specific case, self-torture by proxy is simply not a rational argument. 2. The standard of evidence required for acceptance of an asylum claim is “a reasonable likelihood” (eg less even than balance of probabilities). Why is such highly improbable behaviour repeatedly cited as “evidence” against asylum claimants? 3. The argument has been withdrawn at the insistence of appropriate authority. However immigration judges are now making the same allegations of “self-torture by proxy" against asylum seekers from countries other than Sri Lanka. How is it that a year later it is still being used, and what does this tell us about the asylum system? 4. What is the genesis of this myth and why is it being disseminated? The “Senior Government Intelligence Official”, the “Colombo based human rights worker” and the organisations for which they work are not named by the British High Commission whose letter contributed to the COI Report. Nor is any evidence whatever advanced to support their allegations. Frank Arnold: Do you see a lot of post-traumatic stress disorder, as might be expected in a country emerging from a civil war? FWA: I do - particularly among Tamils whom I examine after they apply for asylum in the UK. FWA: I've seen the scars on their backs. Psychiatrist: They pay people to do that to them. Atrocities have been committed in every land and time. Perpetrators usually feel the need to deny their actions, if only to their inner voices and to their coterie. In self-proclaimed “civilised” or “democratic” industrially developed societies, perpetrators also need to rationalise or disguise their actions to a wider public, which — these days — is international. Modern purveyors of such falsehoods employ public relations battalions, squadrons of spin doctors, and collaborating international partners to help cloak themselves with respectability and disseminate their denials and evasions. The process is not new. Stalin referred to his Western admirers as “useful idiots”. Some of Hitler's US and British supporters in the 1930s had more financial incentives. It is wholly comprehensible that Sri Lanka's rulers should want to hide their crimes or blame the victims. They are engaged in an international campaign to detoxify their image. Discrediting the evidence, promoting tourism, hosting the next Commonwealth Conference and seeking investment in joint ventures to grab and exploit formerly Tamil land, with assistance from a former British Minister are all part of the process. It is less understandable why British authorities should uncritically parrot the abusers' claims. This has contributed directly to the involuntary return and re-torture of at least 15 asylum seekers who have, according to the Border Agency, managed to come back to this country, often with new scars. It also assists the propaganda offensive of a regime whose masters stand accused of the most extreme of war crimes. 1. Lest it be claimed that this man is being put at undue risk because the scars could identify him, he has given formal informed and signed consent to publication of this photo and other information about him. 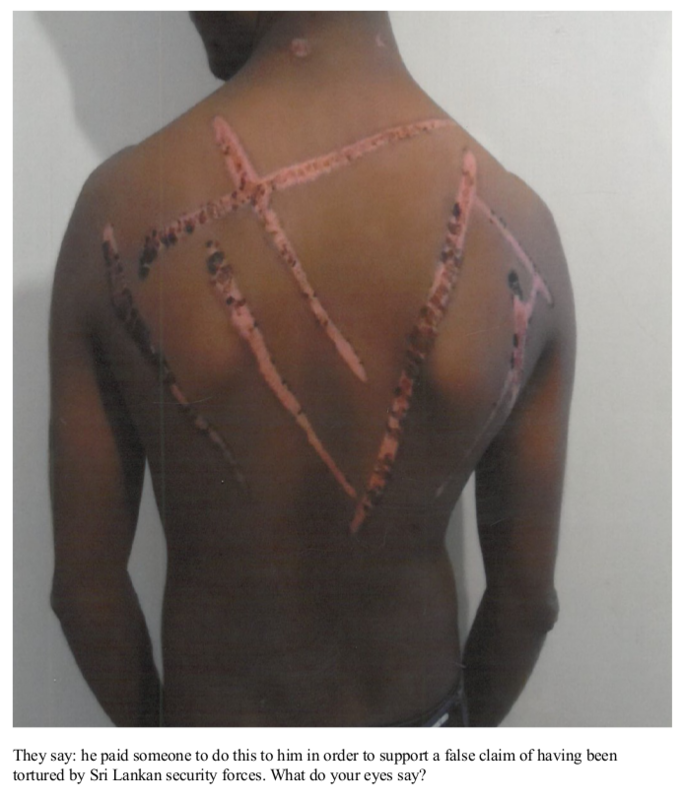 The number of Tamils whose backs display this kind of branding is large and their marks are similar. Thus the practice of this form of torture is recurrent and widespread. Frank Arnold is a independent doctor. He has examined and written medico-legal reports or similar about at least 800 people who gave a history of being physically tortured for (among others) Freedom from Torture, the Helen Bamber Foundation and the Medical Justice Network, which he co-founded. He is a trustee of Medact, a charity which campaigns for human rights and medicine. Medact are holding a series of public meetings on medical collusion in and opposition to torture around the world. The next, concerning Sri Lanka, will be at the House of Lords, on 22 May 2013, from 5.30pm to 7.30pm.